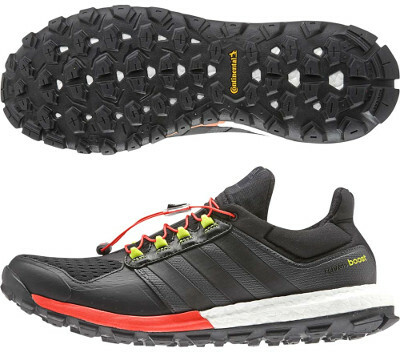 Adidas Adistar Raven Boost are neutral trail running shoes. The Adidas Adistar Raven Boost introduces the well known Boost™ in the premium segment within trail running shoes from Adidas. Marketing changes everything and it seems we will not see any Adistar Raven 4. Plenty of cushioning and with improved outsole, the Adistar Raven Boost is ready for long runs on every terrain. Many changes from its aggresive looking predecessor the Adistar Raven 3, most likely a brand new shoe actually. The Adistar Raven Boost shares with its smaller sibling Response TR Boost a more protective upper (compression collar included) with integrated tongue for improved comfort. An engineered cage embraces midfoot regulated by easy speed-lacing system for better fit. Midsole with mentioned Boost™ foam provides more responsiveness and adaptation on irregular surfaces than traditional and more stable EVA. Outsole has been designed with usual partner Continental with rubber trail king inspired lugs for exceptional grip even in muddy conditions.